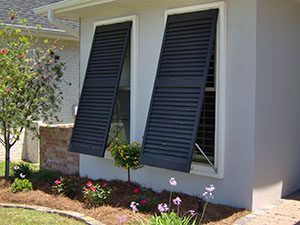 If the time has come to have exterior shutters installed at your home in Crestview, Florida, then allow the experts at Majors Home Improvement to help. Since 1997, we have been a leading home improvement company serving the area and our shutters meet the stringent Miami-Dade County Building Code requirements. So, you can count on them to offer exceptional protection from the elements during a storm. When you work with Majors Home Improvement for exterior shutters for your home in the Crestview, FL, area, you can feel good putting your trust in a company known for its professionalism and skill. We earned the title of Top 500 Remodeler from Qualified Remodeler magazine and were a GuildQuality Guildmaster Award Winner five years in a row. We take great pride in ensuring our customers have a pleasant experience with us, treating each homeowner with courteous attention. We’ll clearly communicate with you as your project progresses so you never feel in the dark about what’s going on, and our installation team will provide Red Carpet Service so that you are given all-star treatment. Contact Majors Home Improvement today to learn more about the exterior shutters we install and the service we provide. When you do, feel free to inquire about financing options for homeowners in Crestview, FL.